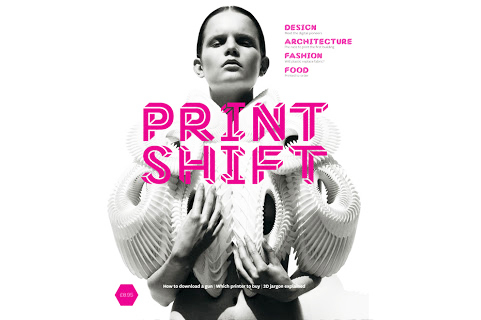 From the Dezeen website: Dezeen launches Print Shift, a print-on-demand magazine about 3D printing produced in collaboration with cutting-edge publisher Blurb (+ slideshow). The 60-page, advert-free magazine explores the fast changing world of additive manufacturing and examines how it is transforming architecture, design, fashion and other disciplines. It is one of the first ever magazines to be printed on demand and can only be bought online via the Blurb bookstore. Written by the Dezeen editorial team, Print Shift is the result of extensive research into a technology that is developing at exhilarating speed. We have spoken to architects, designers, scientists and researchers around the world, travelled across Europe and visited some of the leading studios and factories at the cutting edge of a technological revolution. Order here.